On October 7, a ceremony was held to break ground for a new ECE building. Among the dignitaries were Illinois Governor Quinn, U of I President Michael Hogan, Chancellor Phyllis Wise, College of Engineering Dean Ilesanmi Adesida, and ECE Department Head Andreas Cangellaris. The facility is targeted for completion in spring 2014. 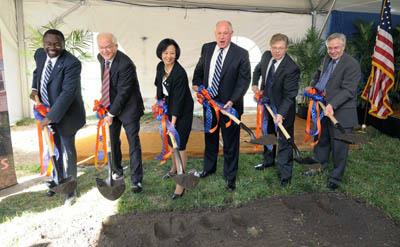 On October 7, a ceremony was held to break ground for a new building that will be headquarters to the Department of Electrical and Computer Engineering (ECE) at the University of Illinois at Urbana-Champaign. Illinois Governor Pat Quinn joined University of Illinois President Michael Hogan, Vice President of the University of Illinois and Chancellor of the University of Illinois at Urbana-Champaign Phyllis Wise, College of Engineering Dean Ilesanmi Adesida, and ECE Department Head Andreas Cangellaris to launch the construction of the building. The groundbreaking ceremony ended with the assembled dignitaries digging into the site for the new ECE building. From left: College of Engineering Dean Ilesanmi Adesida, University of Illinois President Michael Hogan, Chancellor Phyllis Wise, Illinois Governor Pat Quinn, ECE Department Head Andreas Cangellaris, and ECE Professor Philip Krein, who is chair of the ECE Building Committee. “Today is a very special day in the history of the Department of Electrical and Computer Engineering, as we celebrate a dream that, after many years of planning and anticipation, is now becoming a reality,” said Cangellaris in his opening remarks at the ceremony. State funds for the building had been part of a capital bill signed by Governor Quinn in 2009. The state funds will provide $47.5 million toward the project. That is half of the $95 million total cost to build and furnish what will be a major addition to the Urbana campus. In addition to the state funding, the University to date has successfully secured $37.5 million in private support for this important project. Private support for this building has come from many generous friends and donors of the College of Engineering. The College of Engineering and the ECE Department are working to raise the remaining funds to reach the final target of $47.5M in private support prior to the project’s completion. An architect's rendering of the new ECE building. The building is scheduled to be completed in spring 2014. The new ECE building will comprise 230,000 square feet of instructional, research, and office space, with an emphasis on student learning spaces. The building has the goal of achieving LEED platinum certification, which indicates the highest level of building efficiency. The 21 instructional labs will make up 28% of the total space. Spaces for students include an undergraduate lounge, a grad student lounge, student organization offices, and 11 teaching assistant meeting rooms and study rooms. Twenty research labs for faculty and graduate students will support seven research groups. The auditorium will have 400 seats, making it one of the largest gathering spots on campus. It will also enable ECE to hold gatherings for an entire class of students at one time. More information can be found at the website for the Building Campaign for ECE ILLINOIS.